Elibariki Peter Dea is a 10 years old boy, experiencing physical disability with Cerebral Palsy and Mental challenge. Lives in Mbagala (Kipati), Temeke ditrict, Dar es Salaam. He was born at Kizuiani hospital; he is a twin of Winfrida Peter Dea (twinsister). Elibariki and his twin sister are the first born in a family of three children, their young brother is Nelly Peter Dea. His father is Peter John Dea (petty businessman) and his mother is Veronica George Mpepo (housewife). According to his mother, Elibariki and his twinsister had a normal birth but 12 weeks after birth, Elibariki was attacked by yellow fever and was taken to hospital for medication at Kizuiani hospital. Since then, Elibariki grow up development was poor compared to his twin sister as he could not stand or walk. His mother did not know what to do with her little child but when she went to hospital she was told that the child will recover to his normal condition. When Elibariki was 8 months old that is when her mother knew that elibariki was physically disabled and has mental challenges. Elibariki used to attend to CCBRT’s Support unit in Mbagala Zakheim for physiotherapy, but was shifted to Matumaini Centre for Disability in Majimatitu (Mbagala) where he attends once every week. 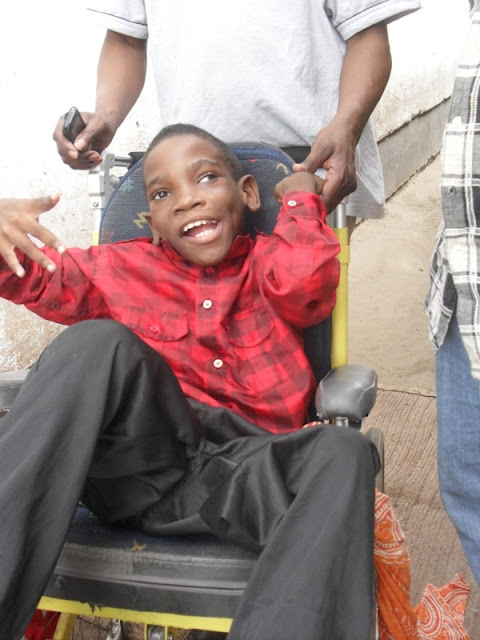 He was identified by TRACED on August 2012 and was provided with a wheelchair from TRACED. Elibariki needs to attend physiotherapy exercises more often for his rehabilitation and TRACED has included him in Individual Programme Plan under Community Based Rehabilitation (CBR) volunteers working with TRACED for Dar es Salaam branch.